For decades, trekking in Nepal was synonymous with Everest or Annapurna, which got 90 per cent of the adventure tourists who visited Nepal every year. But that is slowly changing. As roads snake up to Manang and even Mustang is connected to the highway grid, trekkers are looking for regions untouched by the internal combustion engine. Because of its proximity to Kathmandu, its mountain wilderness and the rich Tibetan culture, the attraction of the Manaslu Circuit is spreading by word of mouth. The trek follows the mighty Budi Gandaki River that scythes between the Himalchuli and Ganesh Himal ranges, cutting steep gorges with spectacular waterfalls. The trail follows the river and leads up across the Larkya Pass (5,400m) and into the Manang Valley, which is the route taken by most trekkers at present. But at the confluence of the Shiar River and the Budi Gandaki an hour and a half walk from Philim, if you take the right fork on the road you reach the mystic and holy Tsum Valley. If there is a Shangri La in Nepal, this is it. The Guru Rimpoche is said to have meditated here, and there is even a cave where the Mila Repa stayed. Tsum is one of the sacred hidden valleys of the Himalaya called ‘beyul’ - places of such tranquility and beauty that they make mortals meditate on the eternal and allow them to transcend to a higher spiritual plane. Beyul means ‘hidden lands’ in Tsumpa and Tibetan, where people fled to in times of strife for safety, or in peace time to pray and meditate. Within these valleys there are nooks and crannies that are even more secluded, where saints go to find bliss. And then there are stories, told by monks at night around the hearth, of places so sacred and secret that they exist in the border between reality and mysticism, between the temporal and the spiritual. The biggest challenge for tourism in Nepal is to preserve our traditional heritage and way of life while we open up to the world. From Humla to Mustang to Tsum, we face the same challenge. The younger generation, mesmerised by the ersatz of modernity that comes with roads and tv forget the true value of their sacred traditions. 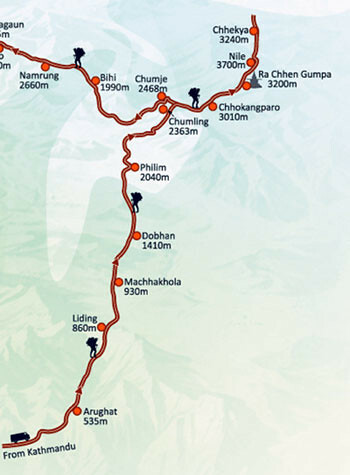 Tsum Valley is the starting point for the holy Kyimolung Trail, the 120km sacred circumambulation in Nepal and Tibet of Siringi Himal. Pilgrims used to trek around the mountain till Tibet became out of bounds, but they still do the partial trek on the Nepal side. Tourism in the Manaslu Circuit has been picking up with nearly 4,000 trekkers in 2012, but only one-fourth of that number went to Tsum which was opened only in 2008 as a restricted area for which visitors need a permit from the immigration office in Kathmandu. One of the ways that we can strike a balance between the traditional and modern is by promoting sensitive tourism so that visitors, aware of the need to preserve local traditions, generate funds for environmental and cultural conservation. This is the successful Annapurna Conservation Area model that is also being replicated in the Manaslu region, with tourism income ploughed into the local economy. Homestay tourism is being promoted, local guides are being trained, and alternative energy resources used. 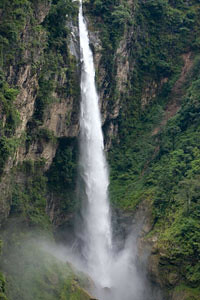 However, tourists and trekking agencies complain of harassment and corruption in the restricted area permit procedure. If these issues can be smoothened, Manaslu and the Tsum Valley have the potential to be the next big thing in trekking in the Himalaya, and a model for balancing preservation with prosperity. Manaslu can be loosely translated as ‘The Mountain of the Soul’, and the Tsum Valley in its shadow can be a spiritual refuge for those who want to escape the stress of the modern world. Sonam Lama is a native of Tsum Valley and an architect who specialised in emergency housing in Germany and Spain. Most books about Nepal’s trekking destinations are written by Europeans or Americans, and contributors to tourist guides written by foreigners. The few books on the Himalaya by Nepalis are by Kathmandu-based writers. Now comes one of the first guidebooks to an exotic trekking locale written by a native. Sonam Lama (pictured, left) was born in the Tsum Valley, and his village school was only up to Grade 5 so he had to come down to Gorkha for high school. After that, he studied engineering in Kathmandu, but felt perpetually homesick. On clear days in Kathmandu, when he saw the Ganesh Himal range looming on the northwestern horizon he couldn’t bear it any longer and trekked home. Lama went to Darmstadt in Germany to study urban development, and specialised in sustainable emergency architecture in Barcelona before returning home to Nepal. He couldn’t stay in Kathmandu, and organises research expeditions to remote valleys, and is an adviser at the Tsum Welfare Committee which works on education, cultural heritage conservation, health improvement, and tourism development in his home valley. Tourists had just started trickling in, and he was convinced that eco-tourism was the future with a potential to lift living standards. Lama, now 34, decided to collaborate with his friend from primary school in Tsum, Lobsang Chhiring, to publish a guidebook. Lobsang used to work for the Nepal Police, quit after the Maoist insurgency, and now works for the Norwegian Cruise Lines. While Lobsang took pictures spanning 10 years, Sonam wrote the explanatory text. 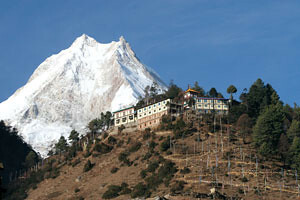 Introduction to Trekking in the Manaslu Region and Tsum Valley was launched last month by Himalayan Map House. "The Manaslu and Tsum regions are one of Nepal’s last Himalayan jewels … however as magnificient as the mountains are, it is perhaps the people of Nepal that are its greatest asset. Below these giant peaks they are hardworking, boisterous, industrious, endearing, brimming with humour, versatile, vibrant, and hungry for change. As new dirt roads begin to snake along the deep gorges and high meadows, progress will surely begin to change the region. 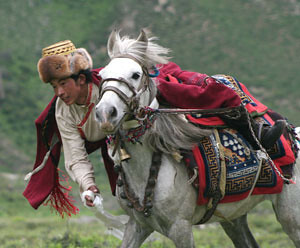 Trekkers visiting the Manalsu and Tsum regions are sure to be smitten by this magical place. All will leave with a renewed inspiration for life …"